Your local fuel oil store for all your heating needs: home, residential, and commercial fuel oil and emergency diesel refueling. Atomic Fuel Oil Transport, Inc. is a full-service, fourth generation, family-owned and operated business that provides oil and heat to hundreds of satisfied customers weekly. We are equipped with a complete staff of professionally trained service technicians, as well as experienced oil truck drivers-- this staff enables us to expedite any problem with personalized, prompt attention. For over 100 years, Atomic has been serving all five New York City boroughs: Manhattan, Bronx, Brooklyn, Queens and Staten Island. 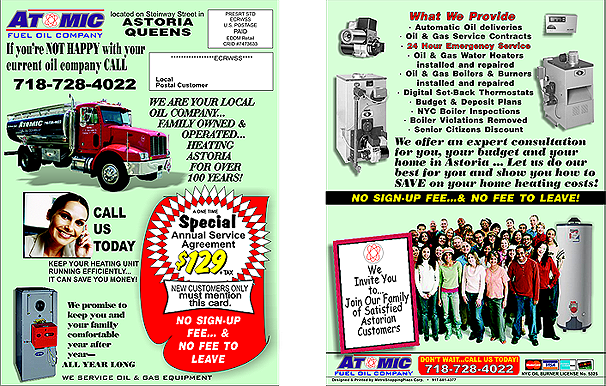 Atomic also serves Nassau and Western Suffolk counties and Lower/Upper Westchester. Join our e-mail listing for news about Atomic Fuel Oil Company as well as insights about Astoria, New York City, and The Heating Industry!